If we’re honest, I’d say many of us could name a biblical story, character or lesson that annoys, if not downright upsets us. I’ll admit to rolling my eyes at Peter and Paul’s quarreling or shaking my head at Jonah’s final act of helplessness (did those three days in the belly of a fish teach him nothing?!). But in my mind’s eye, I see one scene — a particular act of sacrificial obedience — that makes me cringe with discomfort. It’s a scene Moses paints for us with stark, detached realism: the story of Abraham and Isaac (Genesis 22). Now, I know why Moses includes this in his Torah. Or, I like to think I know why. It’s foreshadowing, a Christ image; not just the potential sacrifice of Abraham’s son, but the timely provision of the ram. This passage describes God’s justness and His mercy, and it details sacrifice: a faith-filled man being obedient to a holy God, even until death (though, to be fair, not his own). This story makes me squirmy, and while I’m relieved God provided a way out for poor Isaac, I’m a little put out on his behalf. What if Abraham had called his bluff, shouted, “Now, that’s one step too far, Lord!” I mean, why God? Why is this the test for love, for faithfulness, for obedience? Why this sort of sacrifice? Later on, another bit in the Gospels niggles at me, which is a shame as those four books are usually a balm for my soul in times of spiritual crisis. I love reading about Jesus. I love His words (and, often, silence; the thoughtful tenderness that leaps from the pages). He speaks my language, our Jesus: peace and love, Good News and judge ye nots. If anyone comes to me and does not hate father and mother, wife and children, brothers and sisters—yes, even their own life—such a person cannot be my disciple. And whoever does not carry their cross and follow me cannot be my disciple, (Luke 14:26-27). I feel honored – and exceedingly humbled – to be part of a vast tribe of family and friends serving in a cross-cultural context. In fact, many of my dearest childhood companions preceded and gently discipled me towards this life overseas. Sometimes I even make a little joke of it, making up measures of holiness and sacrifice. Those in the bush without running water or any toilet to speak of (so much of my perception of sacrifice revolves around modern plumbing), ministering between multiple villages and maybe even converting a witch doctor or two? That kind of sacrifice puts them way up the top of the righteousness totem pole. They’re the ones who will get to choose their heavenly mansions, wading through crowns along the way. Then the dear friends sifting through new languages and lexicons, perfecting God’s Word in never-before-read tongues despite rolling power outages and a modest half-day’s journey to the nearest coffee shop. They’re near the top, too. On and on I go, measuring sacrifice with earthly comforts, till I reach us: the suburbanites in Western Europe, living and learning in English, ministering in cafes and pubs, a McDonalds on every corner and our very own tumble dryer. Sure, six hours of daylight in winter, cultural missteps and living under the threat of visa refusals are sacrifices. But not much, really. Not like the others. In fact, I don’t even mind being towards the bottom of this type of totem pole; it’s pretty great company to keep. Simply put, if you’re not willing to take what is dearest to you, whether plans or people, and kiss it good-bye, you can’t be my disciple, (Luke 14:33). Now, I’m no homebody, and my family is far from perfect. We’re a lovely dysfunctional crew, mightily pruned and grafted back together into a slightly messy family tree. But eight years ago, when we first departed that Midwest airport, kissing them goodbye – though a sacrifice, to be sure – didn’t carry the full weight of Christ’s admonition. But this is the truth: forsaking our earthly families of origin is a real sacrifice we all have made, equal in strength and loss no matter our plumbing situation. We let go of parents, siblings, nephews and nieces. Hate is perhaps not the word we would use to describe it, but this is obedient sacrifice lived out. Saying goodbye to those we hold most dear in the world and following Jesus into the unknown. 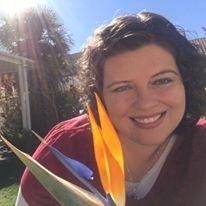 I felt it anew this year as God ushered me into a new phase of motherhood and ministry, interspersed with oodles of anxiety. Oh that I could’ve had my sisters here to walk me through it, to learn from, to relax and laugh with. But I kissed them goodbye all those years ago. To be Christ’s disciples right where He has called them – which is different but no less important than where He has placed me – is a mighty sacrifice. 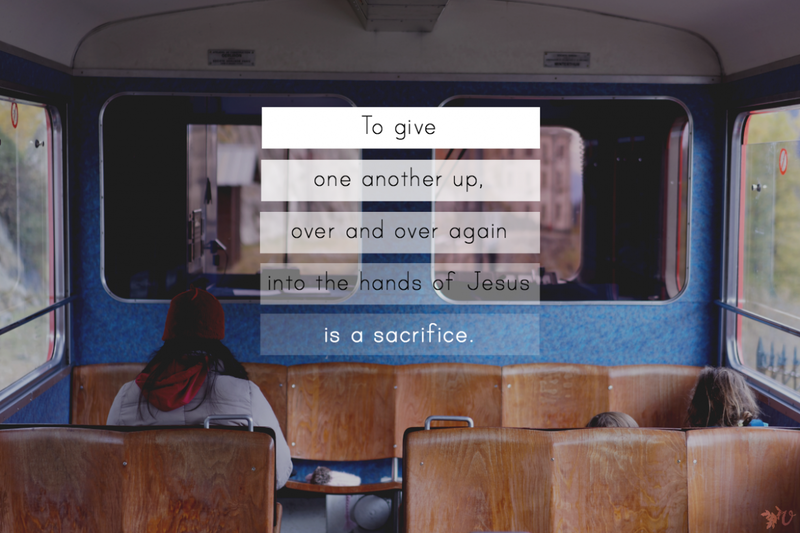 To give one another up, over and over again into the hands of Jesus, is a sacrifice. To offer our souls and our sons to a just and merciful God, whether in desert or jungle or suburb, is a sacrifice. This is a sacrifice we still choose to make knowing He’ll provide the ways, means, and blessing. After all, it is not Abraham’s sacrifice that redeems the story, and it’s not our sacrifice that redeems our own narratives, our ministries or our families. Would we have it, sacrifice for it, any other way? When did sacrifice (of earthly comforts or familial closeness) become real to you? How did God provide for you in the midst of grieving that loss? “To give one another up, over and over again into the hands of Jesus, is a sacrifice.” Walking away in the airport from family was the hardest thing I’ve ever done. Still hard to think about that moment and keep walking into the unknown. And I have sisters too so I can relate! Oh man, I still feel that moment keenly. That first “leaving” really does feel like a breaking of the heart. Le sigh. Thank you for the comment, Jenilee! I found that the leaving, got harder each time. Oh, yes, Mel. I think it’s especially harder for our parents/loved ones. Thanks for commenting! “After all, it is not Abraham’s sacrifice that redeems the story, and it’s not our sacrifice that redeems our own narratives, our ministries or our families. AMEN. That’s all I have to say about that. Thank you for preaching the Gospel in this place today. Or as my good friend Joe Stowell used to say at Moody: Amen… and Amen. 😉 Thanks for the comment and encouragement, Elizabeth! I so relate to your post. I fall into that trap of measuring other overseas workers’ sacrifices. I also live in a beautiful place. When people visit they say, “I understand now why you moved here.” But they don’t always see the giving up of so much. Even the giving up of my own “romanticized” overseas workers ideas that I would live in that village with plumbing issues. But God choose to put me in a beautiful place and fairly comfortable conditions. I’m encouraged again that the great sacrifice is just in the obeying. Thank you for your words and for sharing. It is TOTALLY a trap. You’re right! And one that can deflate us so quickly, causing doubt and guilt to creep in. Thank you for sharing your wise thoughts here! Yes and yes and amen. Sacrifice was redefined for me when I became a mom. It was one thing to make my own sacrifices, but another thing entirely to know that my son would be “missing out”. Family, school options, my vision of what his childhood should look like. He likely won’t know the difference, and is no worse off of course, but I know it and I still find myself grieving the loss of those things. I love that version of Luke 14! Oh Erin, your words here are so at the heart of sacrifice: watching our kids make daily sacrifices without choice, and often without even realizing it. I think on this a lot, asking God to give them good gifts and extraordinary experiences that might make up for the loss. Thank you for speaking to that here. Wow! This hit me straight to the heart core! Reading this after a sleepless night praying for my 31 year old handsome single son living with my aging parents far far away. I too live in a Western European country that speaks English – are we both in the same place, Karen? If so, I must meet up with you! I have lived away from family, friends, brothers, sister friends, children and now four grandchildren for almost 20 years and this passage is hard, but then we have the promise that there is a blessing for such sacrifice. However, on those sleepless nights when the time and space of separation feels eternal – we need others to gird us with truth and encourage us with shared burden bearing. To the young moms reading this, may you daily give your children wings to fly under the shadow of His wings so that when time zones and vast oceans separate they will be trusting in the Heavenly Father and find community that supports them where they are then. My biggest comfort with each passing year is in trusting that there will be no goodbyes in eternity somehow. We women are relational guardians and struggle so deeply when our children suffer, I know I do. It is the hardest pain I have ever experienced, but the Lord gets this and somehow meets me in the suffering. Thanks, again, Karen – needed this TODAY! I am reading this post 6 weeks late, but it was God’s timing for it. I am just now finally coming to terms with that which I “left behind” to follow the Lord to a faraway place. I left behind the possibility of bearing a child–the desire I have held in my heart since childhood. Granted, I didn’t come to this faraway place until I was 40, but there still would have been time to bear a child had I remained and married. Now it is clear that I will not bear a child. And I am in this downward, seemingly endless spiral of grief. It is a messy, messy place for me these days. But the Lord keeps calling me into that conversation that I have been too angry and upset to have. May He open my eyes to see what my heart needs to see to get to the other side of this cesspool of despair.